Sarvikota, Antler Goahti, is a teepee hut located in Mäntsälä, less than one hour drive from Helsinki city center. In the natural environment of Antler Goahti, surrounded by Finnish forest and right next to River Mustijoki, we offer a unique environment for you to have unforgettable meetings, festivities or parties, with wide selection of activities for example canoeing, playful team activities, wild herb foot spas, wilderness cooking and snowshoeing. Please ask for a full list of all activities! The Antler Goahti combines the atmosphere of Lapland with modern technical equipment to have meetings with up to 40 people. The hut itself is a 14-meter high wooden structure with over 10-meter diameter. In the heart of the hut lies a large fireplace built with natural stone. The decoration of the hut is inspired with Sámi culture, Europe’s only indigenous people living with reindeer herding and fishing in northern Scandinavia and Russia. Next to the hut, right by the river lies a lean-to, a semi-roofed outdoor shelter with fireplace, which you can also use for meetings, group work or just enjoy the surrounding nature by the fire. The hut has its own pier in Mustijoki River, which we can use for fishing or as take-off place for our canoeing trips. The facilities and services include e.g. With our wide network of service providers, we can combine to your program troubadours, a visit from Santa Claus, winetasting, golf tours and training, a selection of lectures or organizational coaching. We are also happy to help and try to cover all kinds of special needs and wishes! Please notice that there is no heating system in the hut (besides the fireplace) and on cold weather, warm outdoor clothing is necessary also inside the hut. On rainy weather some dripping might occur inside the hut. In our special river side location with peacefulness of Finnish forest, whispering wind or birds singing in the background, we warmly welcome you, your friends and guests to spend creative, productive, relaxing and unforgettable moments in Antler Goahti! 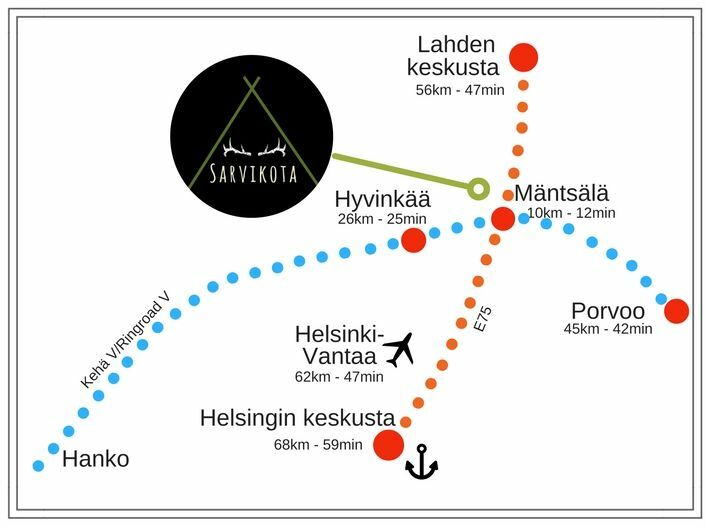 Welcome to Sarvikota – Antler Goahti! What kind of goals do you have for the event? What kind of programs your group has done before?